How awesome is it to ski tour the Rocky Mountain high country one day, trail run in slush and mud the next day, and bike through lush shady trails the day after that? VERY. It is that magical time when you can take your pick of outdoor fun based on elevation and your choices don’t involve five different kinds of skiing (although there’s nothing wrong with that either). Last week was my first real trail run of the season that wasn’t entirely on snow and it felt good… and bad… but mostly good! I guess all of that winter skiing has paid off. MY QUADS ARE TREE TRUNKS, PEOPLE! I hope your weekend was as awesome as mine. I haven’t said much about Kaweah lately because she’s been in a pattern of declining health for a week, then holding steady for 2-3 weeks, then repeating the cycle. We keep thinking her time is near and then she bounces back to a slightly lower level of health, but stable. She wobbles and stumbles and trips over her own feet all the time now. She can’t stand upright for more than a few minutes before her hind legs give out into a tangle under her. We have to hold her up when she potties lest she fall into her own puddles or poopies. But she’s the cutest, sweetest girl in the world and we love her so much. She’s still happy, obsessed with food, keen to sniff all the smells outside. We love on her, sing to her, talk to her, rub her belly and ears, give her massages, scratch the itchy hard-to-reach places, feed her all manner of goodies, and try our best to keep her safe and comfortable. It’s been a good week for her, and that’s all we can ask for at this point. Jeremy and I spend a good deal of time outside throughout the year such that we are tuned into the finer fluctuations in our weather. That means seasonal shifts are enormous changes to our routines. 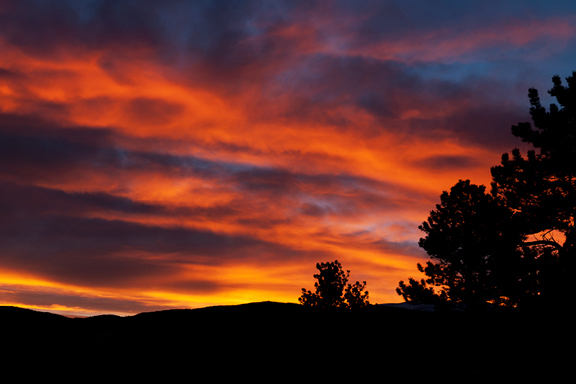 It rained on Saturday for hours and hours – the first substantial non-frozen precipitation we’ve had this year. Ski helmets were swapped for bike helmets and the heavy winter jackets that lined our mudroom walls have been replaced with lighter waterproof spring gear. And even though we grill year round, there is something about warmer weather that makes one crave barbecue. It just puts you in the mood. So let’s get some chicken on the grill! The words “honey barbecued” drew me to this recipe years ago when I dog-eared it in an issue of Fine Cooking magazine. It was only last week when I sat down to make (and shoot) the recipe that I realized there was a little bit of kick to the chicken as well. Chipotle powder in the spice rub and Sriracha in the glaze lend a nice undercurrent of heat that buzzes in the background of your tastebuds. It’s subtle, but lovely in contrast to the sweet honey and brown sugar. The original recipe calls for a 4-pound chicken that is butterflied and flattened. My immediate reaction is to replace a whole bird with four pounds of chicken quarters. We like dark meat in this house. So I replaced the whole chicken with chicken quarters and then I doubled the recipe because it looked like a winner (winner winner, chicken dinner!). We like leftovers. 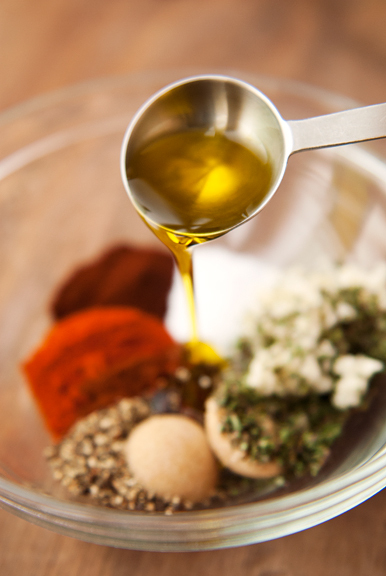 As recipes go, this one is pretty simple once you source all of your ingredients. 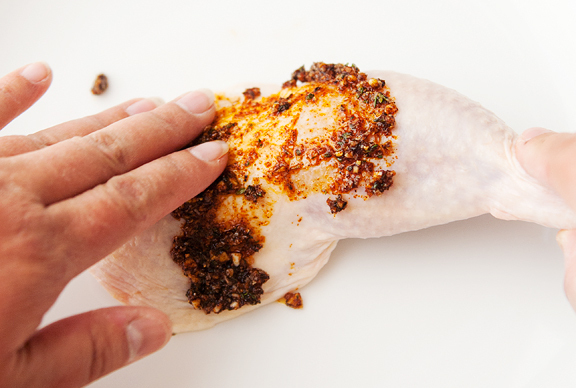 The rub takes minutes to prep and rub all over the chicken. Then you pop the chicken into the refrigerator for 24 hours. That’s day 1. The next day, stir the glaze ingredients together – you don’t even have to heat it on the stove – and grill the chicken. 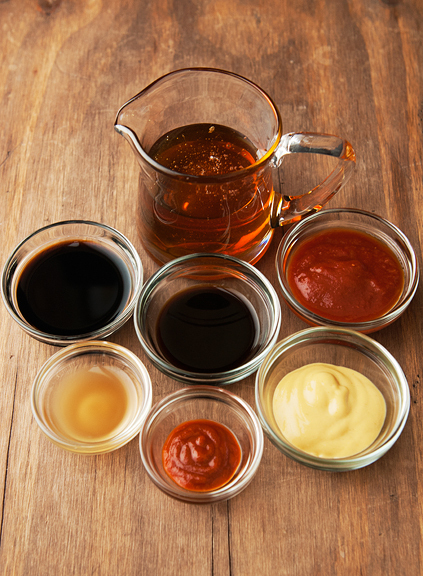 Use half of the glaze for grilling and reserve the other half as sauce on the side when you serve the chicken. While we were cooking, Kaweah kept asking to come out onto the deck so she could stand next to the grill and sniff all the goodness. Oh man, we could not wait to dig into the chicken. It looked and smelled incredible. 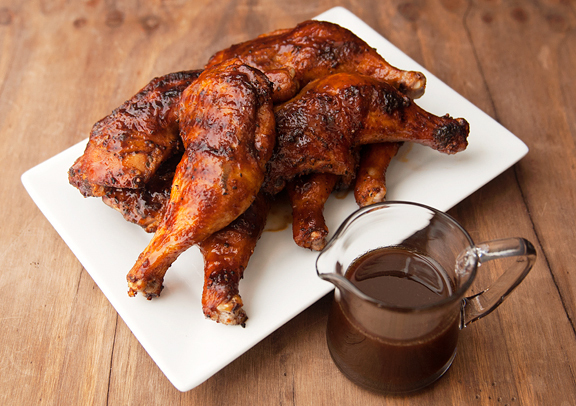 The glaze did a nice job of caramelizing on the chicken skin – that heavenly combination of sugar, fat, salt, and spice. And the meat was tender and juicy the way chicken ought to be. I am so in love with this recipe that it is already in our regular menu as well as our entertaining menu rotation this summer. Put this one in your grilling recipe arsenal. 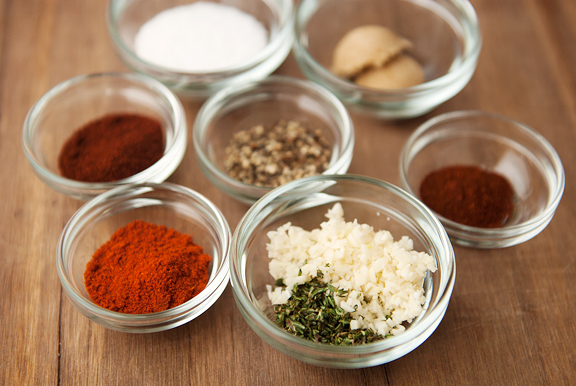 Prep the chicken: Combine the olive oil, kosher salt, chili powder, sweet paprika, brown sugar, fresh thyme, black pepper, chipotle powder, and minced garlic together in a medium bowl. Rub the spice mixture on the chicken pieces and under the skin. Refrigerate for 24 hours. 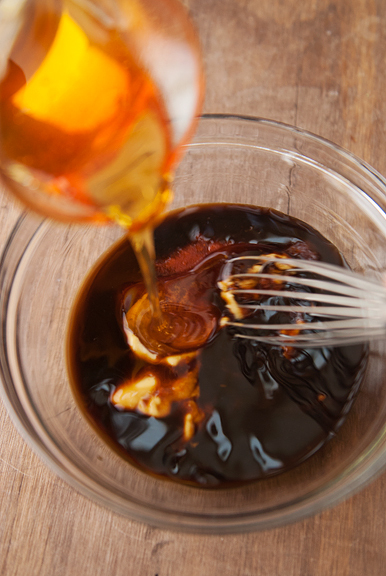 Make the honey glaze: Mix the honey, soy sauce, ketchup, dijon mustard, Worcestershire sauce, cider vinegar, and Sriracha together. Reserve 1/2 cup to serve with the cooked chicken. 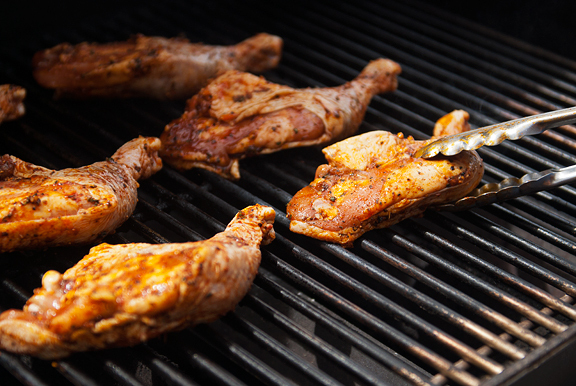 Grill the chicken on a gas grill: Brush the grates clean and wipe with a lightly oiled paper towel. Turn all of the burners on to medium low and heat the closed grill to 450°F. Place the chicken pieces on the grill with the skin-side down and close the lid of the grill. Cook the chicken for about 5-10 minutes until browned and the chicken releases easily from the grates. Move the chicken pieces away from any flare ups that may occur. If you have a 3-burner grill, turn off the middle burner and let the remaining 2 burners stay on medium low. For a 2-burner grill, turn off the back burner and turn the front burner to high. You want to maintain a temperature of 350°F with the lid down. Turn the chicken pieces over and move them to the cooler portion of your grill. Brush the pieces with some glaze, put the lid down, and cook. Glaze the chicken every 5 minutes until done (when a meat thermometer reads 165°F in the thicken part of the chicken – make sure not to touch the bone or you will get an off-reading). This takes about 25-30 minutes. Remove the chicken from the grill and let rest for 5 minutes before serving with the reserved glaze. 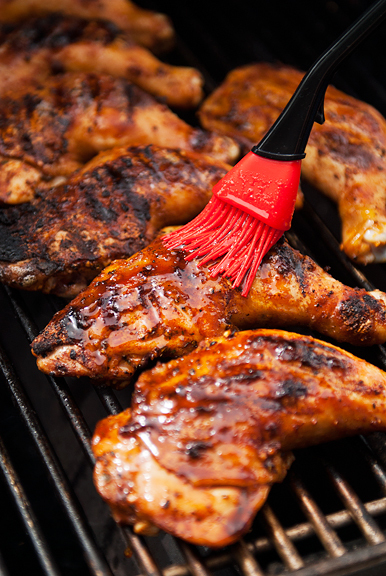 Grill the chicken on a charcoal grill: Brush the grates clean and wipe with a lightly oiled paper towel. Prepare your coals. When the coals are hot, push them to one side to create a hot half and cooler half of the grill. The hot zone should measure 450°F with the lid down. If the coals are too hot, let them cook down to reach temperature. 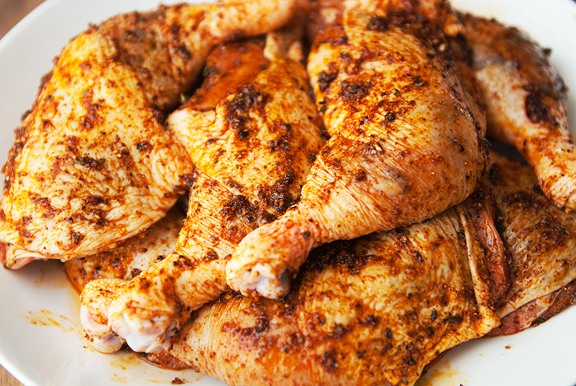 Place the chicken pieces on the hot zone of the grill with the skin-side down and close the lid. Cook the chicken for about 5-10 minutes until browned and the chicken releases easily from the grates. Move the chicken pieces away from any flare ups that may occur. Turn the chicken over and move the pieces to the cooler zone of the grill. The temperature in the cooler zone should read 350°F. Brush the pieces with some glaze, put the lid down, and cook. Glaze the chicken every 5 minutes until done (when a meat thermometer reads 165°F in the thicken part of the chicken – make sure not to touch the bone or you will get an off-reading). This takes about 25-30 minutes. Check the fire periodically in case you need to add more coal as the fire diminishes. Remove the chicken from the grill and let rest for 5 minutes before serving with the reserved glaze. oh, sweet Kaweah. What a lucky girl, to have family like you and Jeremy to honor and love her, and to make every day for her special. 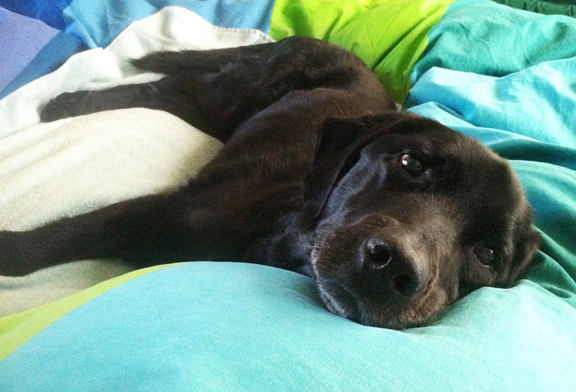 Dogs are so transformative; they ask for so little, but enrich our lives so much. Much love to your family, and belly rubs for your sweet little girl. Thank you for the Kaweah update. The good care you’ve taken of her is surely paying off now, letting her live longer & more comfortably. There are so many overweight animals, and that must not only shorten their lives, but also make them become less mobile more quickly. Chicken looks beautiful & delicious! AWW, Kaweah looks so comfy and sweet. The more time I spend with my dog, the better person I become. Looks like it’s the same with you two. I am going to make this for dinner…big hugs to your pup. Sending good thoughts to Kaweah and wishing her lots of treats and yummy grill smells and good days. On a different topic, have you ever tried crust cruising? If you skate ski, this is just skate skiing anywhere on the firm early morning crust of spring. 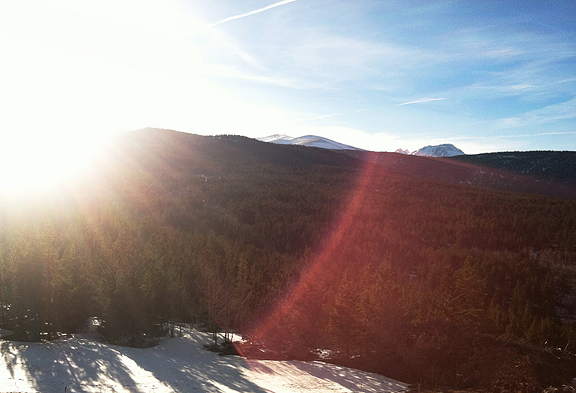 It is fabulous up here in SW Montana and I imagine it could be great fun around Crested Butte, too. 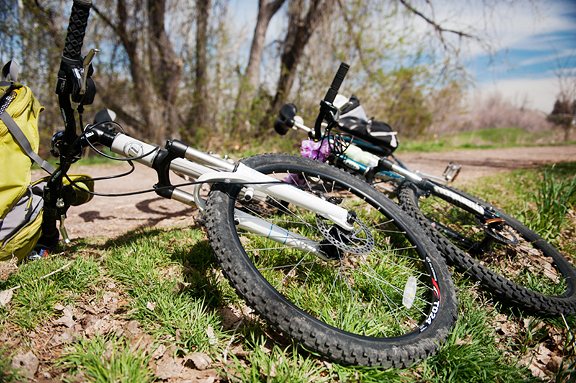 So many great ways to get outside! Sending good thoughts to Kaweah! Adorable pup. Awww, so happy to see a Kaweah update! Lots of hugs and love for you and her. So happy to find your blog a few days ago. You have so many of my very favorite dishes – all in one place! I couldn’t believe it :) Agedashi Dofu, Carnitas, Country Fried Steak & Cream Gravy, pizza and on and on. Such a diverse and scrumptious variety of tastes. 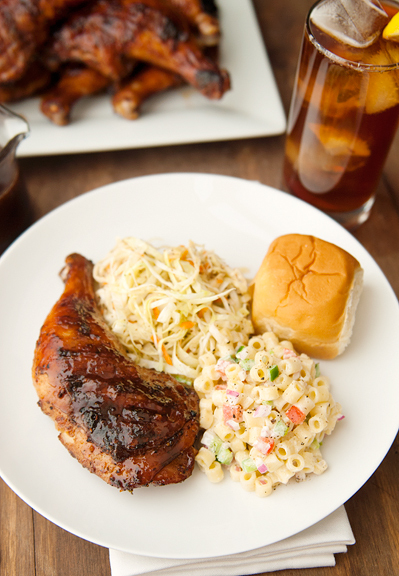 We’ve already made Ma Pu Tofu and Char Siu – both delicious and easy to make; next we’ll whip up your Honey Chicken BBQ plate, including cole slaw & macaroni salad and a soft white roll on the side. Heaven! We lost our beloved 13 year old lab 4 months ago. He had a wonderful life, full of love and homemade food. We couldn’t have loved him any more than we did. And that does bring some measure of comfort, although it has taken some time to realize this. So,at the risk of advice-giving, I will say….keep doing what you’re doing. All of the love and goodies you are giving sweet Kaweah will come back to you, and you will have some comfort knowing you have no regrets. 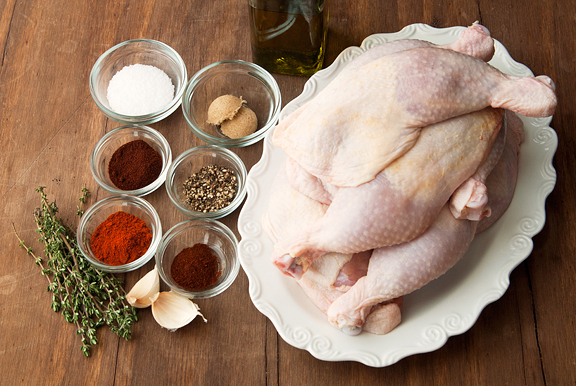 Would you recommend brining the chicken beforehand,as cook’s illustrated often does? I am excited to try the chicken recipe. I absolutely enjoy your recipes. 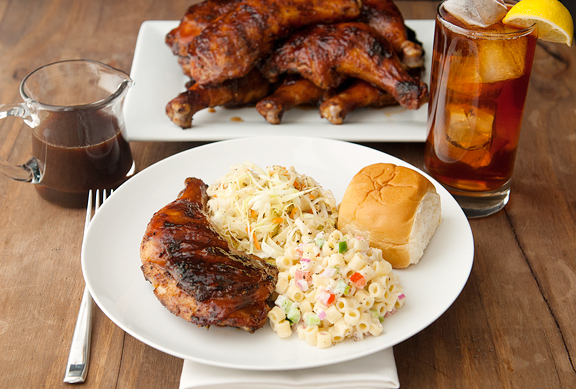 I noticed that you plated the chicken with a macaroni salad. Have you or will you share that recipe? Those deep eyes of hers just radiate love! And no one with a heart could resist her. I hold my breath every time your post pops up in my email. And then I exhale when I read she’s still with us. All of us! Will try your chicken, and will always love your baby. Love to you, Jeremy, and Kaweah. I might have to take a hiatus from reading your blog– at least when other people are around– because when I read the post where you tell us she’s crossed the rainbow bridge, I’m going to dissolve into a puddle. My family has had black labs since before I was born, and I swear they have the kindest souls. The smell of the grill keeps all dogs going. At least, I hope so. This recipe will sure keep me going! Such a sweet, sweet face and I’m so glad to see an update. Like Linda I always find myself holding my breath when I see a new post pop up in my blog reader and hoping that sweet baby is still with you (and us, she’s got so many fans!). Our 13 year old dachshund Calvin is showing his age more lately (back problems that seem to appear more frequently and making me an absolute worried mess wondering if this will be the time we have to make a horrible decision), but then he bounces back and is as feisty as ever and I appreciate every single second I have with my incredibly sweet boy. This chicken looks amazing and we’re “those people” who don’t like dark meat, so I’ll have to try and make do with some breasts. (there is a bad joke there and I’ll just leave it be) Can’t wait to give it a go! i agree with every post about kaweah. black labs rock. thank you for the updates; i know how hard this is. she couldn’t be in better hands. I love your enthusiasm for this crazy time of year. I just want it to be warm so I can have cookouts on the patio and make great grill recipes like this one! First time visiting your blog. I am so impressed by the loving care you are giving your precious Kaweah. Most of what makes the evening news is stories of poor animals that have been abused and those stories absolutely break my heart. It was so uplifting to go searching for a recipe and find a story about a beloved dog being cared for so lovingly by her mom and dad. I know it must be a difficult time for you knowing that her time with you is limited but she is happy, well fed, well loved and made comfortable. You are all so lucky to have found each other. 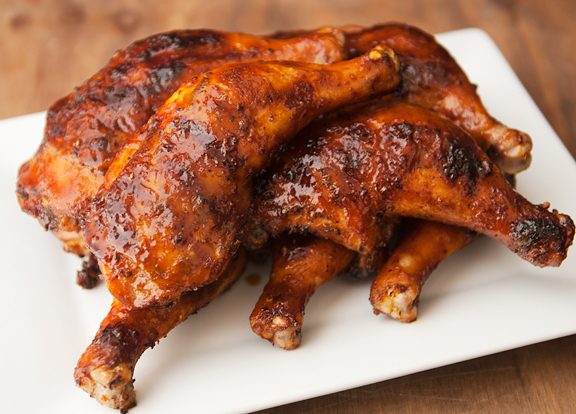 PS: I think your barbecued chicken recipe sounds incredible! farmerpam – She definitely likes time on the big bed! 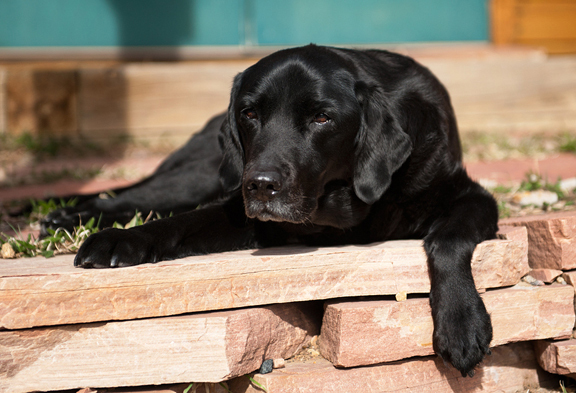 Linda - That's what Kaweah has: canine degenerative myelopathy. It's hard watching her deteriorate, but we're making it as easy as possible for her. Ellen - no, I wouldn't. This rub is sort of a dry brine. If you double brine, then it might be too salty. That's just my take on it. Monica - I don't have that recipe posted. It's just something I threw together. Perhaps I'll post one later (but it's like any generic macaroni salad: macaroni, mayo, dijon, vinegar, onions, tomatoes, celery, pepper). April - Believe me, I dread that day more than any of you. I think if you do this with a whole chicken or with breasts that have the skin on, it will work! Okay. I made that chicken last night and I will never be the same! I used only thighs, as that’s what I had, and simply could not have been happier with the result! 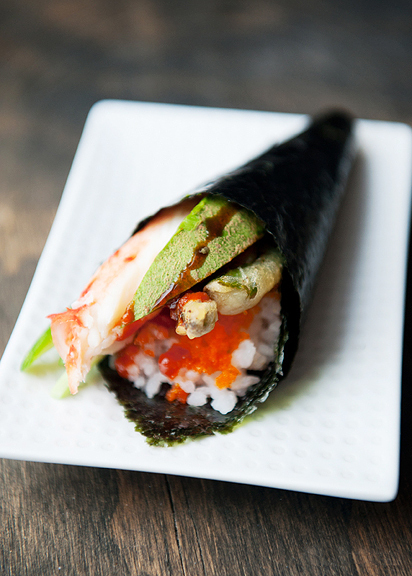 Seriously – we’ll be adding this one to our regular rotation. I’m even thinking of trying it with wings. Super recipe, Doll-face! Thank you! I have made this recipe so many times and it is a no-fail! 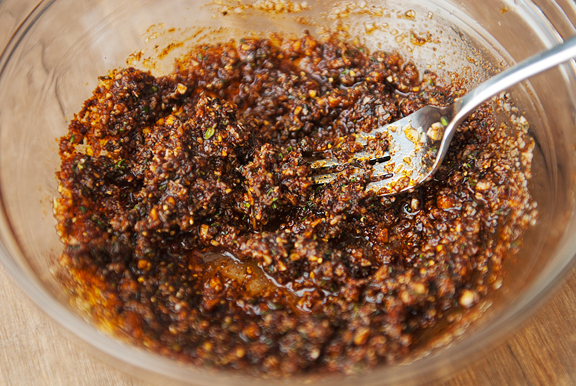 I’ve subbed in different spices for the rub, and even just gone straight store-bought sauce in a pinch at the cottage, but still using this method. This recipe makes me a rock star! Thank you! !